As she crossed Forbes Avenue in the heart of Oakland on Monday, Sara Klein had her head down and her gaze locked on the screen of her cell phone. The same was true for Nicole Barnett, just steps behind her. Both were seemingly oblivious to the cars, bikes and other pedestrians thickening the University of Pittsburgh campus during a class change. Fortunately, both were tethered by a length of rope to someone who was paying attention. Maddie Manning, clad in a lime-green T-shirt emblazoned with “Street Smarts” and “Don’t be a road zombie,” led them safely across. The scene was repeated several times across the Pitt campus Monday, the start of a weeklong effort to promote safety. “Because Oakland is home to so many different modes of transportation and we’ve just started a new school year, we wanted to raise awareness for all, including motorists, bicyclists and pedestrians,” said Juliann Sheldon, safety press officer for the Pennsylvania Department of Transportation. 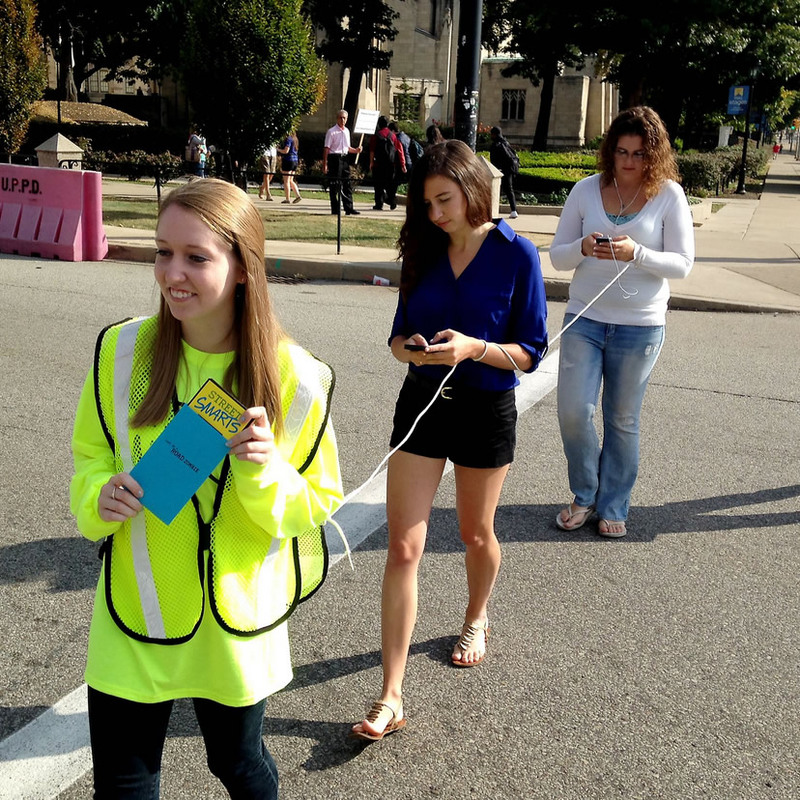 Ms. Manning, an April graduate of Pitt who works for the Oakland Transportation Management Association, served as the equivalent of a seeing-eye dog for the distracted Ms. Klein, a Pitt senior from Toledo, Ohio, and Ms. Barnett, who works on traffic safety for the Allegheny County Health Department. “They’re blind because they’re texting and not looking,” said Lachelle Binion, an administrator with OTMA. It’s not hard on any given day in Oakland to find people crossing in mid-block, walking while tapping away at their phones or listening to music on headsets, or riding bicycles on the sidewalks or in defiance of other traffic regulations. “It really is a hodgepodge of violations,” Ms. Sheldon said. The bicyclist went ahead, and Lt. Kenna radioed to motorcycle officers to pull him over. He was cited for running a red light, and faces the same potential penalties as someone who does it in a car. Police and other event participants handed out fliers with safety tips for drivers, pedestrians and cyclists. The material struck a chord with Hope Smith, a Pitt freshman from Beaver Falls who had a close encounter with a car earlier in the day. A woman turning onto Fifth Avenue “saw me at the last minute” in the crosswalk and hit her brakes. “She apologized,” Ms. Smith said. Oakland Safety Week continues today with bicycle safety events at the William Pitt Union lawn, in the lobby of Frances Ward Hall at Carlow University and at Forbes and Morewood avenues near Carnegie Mellon University. On Wednesday, Pittsburgh police and officers from Pitt, CMU and Carlow will take part in a traffic enforcement blitz; a DUI simulator will be on the Pitt campus Thursday, and a safety week fair will follow Friday. Ms. Sheldon said there have been 265 crashes on Forbes Avenue in Oakland in the last five years, 35 of which involved red-light running and 39 involving pedestrians. Pitt police have written 1,300 traffic citations this year, mostly for moving violations such as speeding and running red lights or stop signs, Lt. Kenna said. “We’d like to encourage people to try to pay more attention to their surroundings,” he said. Jon Schmitz: jschmitz@post-gazette.com, 412-263-1868 or on Twitter @pgtraffic.